On March 31, in fine weather, with everything onboard as routine as could be, the Stellar Daisy began to list, listed badly, rolled over and sank in a few minutes, taking with her all but two of her crew of 24, and a lot of sintered iron ore fines loaded at Ilha Guiba in Brazil for carriage to China. The published accounts of the two survivors make it clear that the loss was sudden, that there was insufficient time to abandon ship in good order, and that they owed their survival in the water to luck. The weather was good and everything onboard this big ship was perfectly routine – until it wasn’t. She didn’t hit anything, nothing caught fire, there was no explosion. She just took on water – a lot of water, very suddenly, she listed, she capsized and she sank. The Steamship Mutual P&I Club, with which the ship was entered, were contacted by this site and issued, true to their reputation, a firm “No comment”. We have been told, by its apologists, that the Marshall Islands is not up to investigating this sort of loss, and indeed we have heard that “the only people with the skills and resources to investigate this properly are the UK’s Maritime Accident Investigation Branch” – whom the Marshall Islands have failed to appoint to do their job for them. Since the owners won’t comment, and neither will their P&I club nor their flag state nor their class society, we must speculate. What follows is, I hope, reasonably well informed speculation. If I am mistaken, the owners, or their P&I club or their flag state or their class society, are very welcome indeed to correct me. I am deliberately ‘trailing my coat’ in the hope of drawing out those who may know more than I do, because, as an industry, we need to know, before it happens again. We know that the Stellar Daisy began life as the VLCC Sunris III, at the Nagasaki yard of Mitsubishi Heavy Industries (MHI) and was delivered to her first owners in July 1993. She was a single hull tanker, built by one of the world’s leading shipyards, and she was converted in China to a very large ore carrier in 2009. I am now going to speculate and say five things, each of which may be wrong. First, as I recall, MHI were, at that time, exponents of the use of higher tensile steel to reduce the lightweight of ships. Second, as I recall, MHI’s usual practice – as was the practice of other good yards building single hull crude carriers – was to paint the deckhead and the bottom of each tank and to carry the paint up and down a distance of around three metres on the side shell and bulkheads. Third, as I am quite sure, because I asked an eminent class society, and it’s obvious anyway, when you convert an oil tanker into a dry cargo carrier, you can disable the inert gas system, and common sense tells us that that is what you will do. Fourth, as is obvious to everyone, the stresses imposed on a hull by a full cargo of liquid with a specific gravity of around 0.8 are going to be very different indeed to the stresses on a hull imposed by a full cargo of granular ore and fines with a specific gravity of around 5. Fifth, if the conversion was carried out to a good standard, which we have no reason to doubt, there will have been considerable strengthening of the structure in way of the new tank tops of the new cargo holds, to redistribute the stresses that we have just remarked on, and there will have been similar strengthening of the decks in way of the new hatch covers for those same holds. Now I am going to quote several very eminent naval architects whom I have had the pleasure of knowing over the decades – in large ships’ structures, the devil is in the detail. In a good shipyard or a good design bureau and in good class societies, a great deal of thought goes into detail design to avoid stress raisers and to avoid crack propagation. We now have a ship which, for 16 years, spent roughly half her time with crude oil (whether sweet or sour is more than we can know) in her tanks and almost all her time with those tanks filled with an atmosphere of inert gas – scrubbed funnel flue gas. This is a recipe for low rates of corrosion. The original inert gas systems were developed, not to stop tankers from blowing up, but to slow down the rate of corrosion in uncoated cargo tanks. As Michael Caine once said, “Not a lot of people know that”. Now, you do. In owning and operating single hull tankers, we used to spend some time thinking about which tanks were permanent ballast tanks and which were cargo tanks and from time to time we would consider changing tanks over, to even out corrosion. And we used to spend quite a lot of time thinking about stress cracking where Isherwood System longerons passed through ring frames, and stress cracking in decks. Many 1970s VLCCs were scrapped for just these reasons, at rather modest ages. The same ship now spends about eight years during which what were once cargo oil tanks, and are now ballast tanks, are full of sea water for about half the time, and full of damp air for the rest of the time. This is a recipe for much higher rates of corrosion inside those tanks. 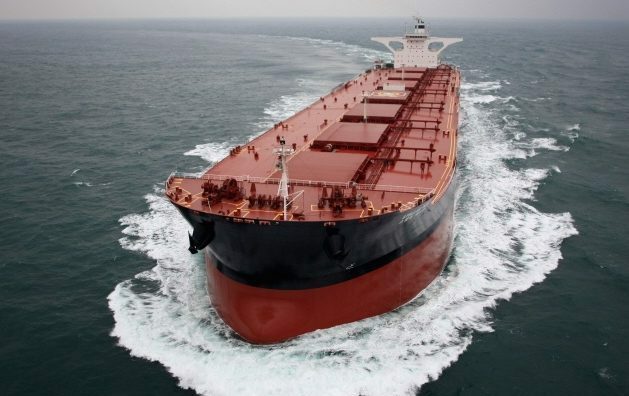 An ore carrier or ore oiler has side ballast tanks which are much larger than those of a bulk carrier or ore bulk oil carrier, so flooding a single side ballast tank on an ore carrier is going to have a bigger effect on the ship’s stability than flooding a space on a conventional bulker will have. I suspect that the true cause of the loss of the Stellar Daisy may lie in people thinking, as so often happens in our industry today, about their own ‘part of ship’ and not thinking enough about the ship and her cargo as a whole. The ship is now 23 years old, nobody expects her to pass her fifth special survey, and she is carrying ore, which may or may not be loaded very quickly. Dear reader, do you think that this was – do you think that this is – a good idea? Because, as I have said before, ships should not suddenly sink, in good weather, in 2017. Unsafe at any draft – Part one can be read by clicking here. Interesting and many thanks! A few things to add, there are many which can conduct investigations on this planet as well or better than MAIB. The reason why ships sail which should not sail is simple! Risk takers which could not care less if the risk materializes, insurance companies underwriting whatever in the hope that nothing will happen and if it happens, funds are available to sort it out. Class approving things which should not be approved because of money and a limited liability in case something goes wrong. Flag built to approve by money alone. The whole system is very corroded in itself and a ship and their crew is nothing more than object number. Most people sending ships and crew out to take the risk have never worked onboard! Put all parties which have no problem to have ships and mostly incompetent crew sailing around onboard for a couple of months. There are a lot of prudent people both onboard and ashore but the system is suffering from excessive corrosion due to power and greed. If we truly like to transform shipping into a safer and smarter business we need to establish accountability and ownership which is transparent and and fast. Hiding by not commenting does not help at all. We cannot put structural strength risk assessment on a ship crew which in many cases does not even know how to read and write properly. There are abundant amount of still floating “rust buckets” around which will be a mere statistical mark in the insurance industry loss records and ratio and as a discussion topic while wining and dining with media strategist, lawyers and other specialists. This can only happen when we are completely detached from the reality and what ship crews are lured into. If risk takers can hide nameless behind shell companies and lawyers are building corporate veils as “common sense” business and the same is insured against a premium and everyone thinks it is OK, the we will see the same going to be normal in 2027 as well. There is no specific instance to blame and we are all as guilty because it seems leaders involved to think it is OK to do the things we do. We always have problems when we just find crew onboard and ashore people which against a few dollars are happy to shut up and “sail along” with hope that nothing will happen. People seems to do whatever for money both onboard and ashore without the capacity to reflect on risk and its consequences. Accidents will happen and a unfortunate connected dynamic which is part of humans doing things in environments full with known and unknown stressors but, structures reaching end of lifetime by, corrosion, shareforces, torsion and bending moments is not an accident and a very forceeable event which can be forecasted. Shipping might be great again when we find genuine and real shipowners with a a face and name not hiding behind insurance, class and flag and which respect and safeguard their crew and environment above anything else. There are a few around but it would be highly welcomed to see many more! I agree with all you write. Yes, indeed there are other national bodies with the same ability as the British MAIB – some of these these come to mind at once – the Japanese Maritime Safety Agency (MSA), the Chinese Maritime Safety Agency (MSA) the German Federal Bureau of Maritime Casualty Investigation (BSU), the American National Transportation Safety Board (NTSB) and the Norwegian Accident Investigation Board (AIBN) and those are just the ones that I have dealt with myself. I was reporting the comment, not endorsing it! I’d like to offer a new definition of “flag of convenience” – a flag state that can’t be bothered to investigate its own accidents. Liberia established its reputation in the field in the 1970’s when the Liberian Government – to general surprise – started to appoint Sir Gordon Wilmer to chair Formal Enquiries. That is not a root cause but potentially a contributory factor. The Root Causes are outlined very clearly by Jan and Andrew. I agree. Indeed, I have become a convert to the aviation way of doing things. We should be willing to learn from them. It is a truism that surgeons and pilots are the two groups of people whose self esteem is such that they will always tell you what they do for a living. If surgeons have been happy – despite their not-small egos – to learn the principles of CRM from aviation – and they have – then shipping should have no problem in doing likewise. And the same goes for maintenance.. Check Lufthansa story just loaded ! Our industry never learns from basic mistakes because incidents (like this) are handled behind closed doors. This is the process so many “reputable” parties prefer. Hush hush. Spot on and to the point! Lets hope that the Authorities mentioned take some note? This should also include a detailed examination of the sister ships which should not be allowed to operate until they have been inspected. It is astonishing that a ship of this age is carrying inherently volatile cargoes and they should be scrapped before any more lives are lost. It is worth noting that in its earlier incarnation, as the manager of the Liberian Register in the pre-Charles Taylor era, International Registries Inc., who manage the Marshall Islands registry, did carry out Formal Enquiries to a good standard; examples would include the Enquiries into the Venoil / Venpet collision and into the loss of the Amoco Cadiz. Andrew’s comments are entirely apposite. However, it is worth pointing out that the enquiry into the loss of the Amoco Cadiz was carried out on behalf of the Liberian Registry by ABS. The cause of the casualty was steering gear failure, brought about by various design defects and changes in the hydraulic connections to the steering gear, all of which were approved by ABS. It is therefore not surprising that ABS made much of the Master’s delay in seeking assistance, and did not focus at all on the initial failed component. WHAT YA GONNA DO TO ME? I agree that MAIB is probably the best agency for investigating any shipping casualty, and that is precisely the reason MAIB will never be allowed within an arm’s length of this investigation of the loss of Stellar Daisy. Talk about being a victim of its own success. It is sad that the tone of this article and some of the accompanying comments are akin to tabloid version of sensationalized reporting and owner/flag/classification society bashing to boot. It is scandalous to suggests that Marshall Islands registry is evading their responsibility just because there is no public announcement by the International Ship Registry(IRI), the flag administrator, so far (which they owed no obligation apart from submitting their casualty investigation report to IMO after completing their investigations). Adding further insult to injury, a comment posted by the author of the article and supported by a commentator that the UK government branch with the acronym, MAIB, is the agency that best comes to mind that can do this investigation in an effective and transparent manner(that I inferred) smacks of highfalutin. Granted, checking the website of MAIB, it is admirable that their substantial investigation reports are available in their website for access by the general public. By contrast, if one accessed the IMO Global Integrated Shipping Information System website(GISIS) and under the tab, Marine Casualties and Incidents, a search for Marshall Island administration reports from the beginning of this century(the last 17 years), only came out with surprisingly, one report(on a fishing vessel fatality of a crew member )available for download. However, using such comparison alone does not do justice but only points to policy making decisions of flag states administrators whether to release to the public or not and that is their prerogative. Regardless, all member flag states have to comply with the Casualty Investigation code and meeting all of its mandatory requirements. I suggest to the author and the commentators, view the text of this code(by doing a search using any search engine) and have an appreciation on what is expected of flag states when a very serious casualty occur. Further, I recommend the author write officially to the Marshall Island flag registry and inquired from them whether they would release the report on their website when the investigations had been completed. That to me, is a sensible and visible step to take in the quest to find out what happened. Similarly, I trust that the families of the deceased can find closure. In that regard, I am cautiously optimistic that given the high profile nature of this casualty and with large loss of lives, Marshall Island flag will release such report to the public domain. One need not look further for a comparison than another high profile sinking more than 2 years ago(incident occurred in beginning of January 2015 and in South East Asia water) on a Bahamas flagged bulk carrier, known as BULK JUPITER. The report was released by the Bahamas flag state administration some nine months after the casualty and which they seldom do on other casualties. Finally, on a point made by the author that the vessel sank in good weather, all I know and experienced before when I previously sailed on a fully laden cape size bulk carrier carrying iron ore (in 1984)transiting the South Atlantic for North Asia destination, the general weather condition might be described as good, but the ocean swells condition is a prevailing and persistence occurrence in the South Atlantic and remembered seeing with my own eyes as a bridge watch officer, the flexing of the deck as it labors under such stresses. I leave it to one’s imagination what must be on a young officer’s mind and whether it was normal or not. Therefore, the points made by the author on ship structure constructions and stresses and quoting unnamed naval architects had set my train of thoughts in motion but other than that, not qualified enough to comment further as not a qualified naval architect. However, I wish to comment that it is equally scandalous to suggests that the IMO mandated IG system was to prevent tankers from blowing up and this revelation posted here said otherwise. It is difficult to read carefully from the back of a high horse. I did not suggest that the IMO mandated the use of inert gas as a means of reducing corrosion. The use of inert gas was pioneered by Sun Oil in the 1930’s, and taken up by BP soon afterwards as a means of reducing corrosion. The SOLAS requirement for tankers of more than 100,000 tons to be fitted with an inert gas system dates from 1974 and entered into force in 1980. I think you may find that, far from being “scandalous”, I am historically correct. Amongst the naval architects whom I did not name were Dr Euan Corlett and Sir John Parker. The administrators of the Marshall Islands Register, IRI, were once the administrators of the Liberian Register, and in that capacity they carried out several Formal Enquiries to a high standard, often under the chairmanship of the late Sir Gordon Willmer, QC. It is to be hoped that they may be persuaded to do so here. Where we differ fundamentally is that you suggest that the duties and responsibilities of a flag state are defined by, and owed to, the IMO and that they “owe no responsibilty” to report to anyone else. I think that the duties and responsibilities of a flag state are owed, first, to the mariners who sail aboard the ships that they regulate, and after that to the public at large, since the high seas are the property and the responbsibilty of us all. Your comments in response to my posting well noted. I must also add that I must also be factually accurate and my posting referring to International Ship Registry as IRI is erroneous. It should read as International Registries, Inc.(IRI) a corporation registered in one of the states of USA. Adding further to what I said about IRI producing only one investigation report if one follows the IMO website, again to be accurate, in IRI website and under sub-menu, “Investigations”, there are seven reports available for downloads. The one report that stand out was the DEEPWATER HORIZON report. This MODU disaster needs no elaboration as to the world wide condemnation that ensued. Reading the executive summary of that report, it states that it conducted its own independent flag state marine casualty investigation by drawing upon documents submitted to the US Department of Interior and the US Department of Homeland Security Joint Investigations team, using the testimonies of individuals before the Joint Investigations team, its own investigators’ findings and even outside experts. It elaborated further by stating that in assisting in its understanding and analysis of engineering and technical aspects, the administrator retained drilling, engineering and fire science consultants too. So, there is comfort knowing that the administration has the will, resources and capabilities to do a thorough investigations. Let the reader be the judge of the quality by reading the DEEP HORIZON report as a pre-cursor on what to expect, when the STELLAR DAISY report is published(speculating at this point). On the topic of a Formal Inquiry, perhaps that has been deliberated but not made known to us. I can speculate the practical difficulties(including jurisdiction issues) involved as the cooperation of the South Korean government for consent as most if not all of the leading actors involved in this casualty are South Korean entities as well as decision making individuals, both ashore and at sea. Assuming there is political will by the Korean government to have such inquiry done by the flag administrator in Korea, there is no harm for you with your vast contacts and network, to urged, Marshall Island shipowners and to prompt them to initiate such formal inquiries with their flag administrator. You could even canvas leading shipping personalities to steer the administrator in that direction. I wish you all the best in championing for the truth to be uncovered. Lucid and pithy, great style and fascinating content. I like this 2-part article very much. Regarding casualties databases for tankers and bulkers a good one, far better than GISIS, was ‘CTX’ from the naval architect Jack Devanney who directed the construction of 8 VLCC & ULCC in South Korea. Unfortunately it is not any more available on internet together with his excellent book ‘The tankship tromedy’ which deals also with structural and corrosion problems. However the book is still available on Amazon. In this book Devanney wrote that he contributed to the creation of the Mashall Island register, but later he had himself not much respect for flag states by stating: «…Flag State regulation has been an oxymoron… The successful Flags states are the one which offer the shipowner the best deal. It’s not regulation; it’s an auction. Forget about the Flag State. It is not worth discussing.». Regarding an investigation, the article 23 of the ‘International Conference on Load Line 1966’ states that administrations must conduct such an investigation of any casualty occurring to the ships for which they are responsible and communicate its findings to the IMO, but the organisation cannot disclose the identity or nationality of the ships! Anyway, as the Stellar Daisy lies on the bottom of the Atlantic ocean, there are little chances that the Marshall islands shall carry out such an thorough investigation as the one for the Derbyshire which took twenty years to get started and had to be partly financed by the European Union in addition to the funds provided by UK. Pierre – actually “The Tankship Tromedy” can still be found on the CTX website. Well done to Andrew for his excellent and hard hitting commentary. I share his outrage. I am also sure that Samuel Plimsoll would weep in his grave at the disgrace the maritime industry still heaps upon itself in the pursuit of profit. As I see it, the ‘elephant in the room’ is the IMO and its highly political regime that supports shonky flag states, sloppy class society performance and bends to the wind of ship owner lobby groups. The evidence is that EMSA, AMSA and the USCG seem to be of a similar view so I am quite confident that I am not delusional. But what is the ultimate solution? The IMO cannot do a proper job as a UN Agency as it has no teeth to enforce its Conventions and never will do. Nor is it capable of being objective. Or as Andrew suggests, are we meant to say, “Oh well, that’s life, and the IMO regime is better than nothing”? Positive suggestions please. You put your finger on it. I would just add “shipper lobby groups” to “shipowner lobby groups”. Both are up to the same game at the IMO; I have seen the process at work and no doubt you and others have too. The IMO has well the powerful teeth of the Port State Control. Unfortunately outside the Paris and Tokyo MOU it is far less efficient, often misused by corporate or private financial interests. And even inside these two, the lack of experienced masters and engineers among the PSCo fix that inspections are not focused on the real problems. Pierre – thank you for your contributions here. I agree with all you say.